Pennswood Village has made many efforts to broaden the community’s horizons through the diversity of residents and staff who live and work there. 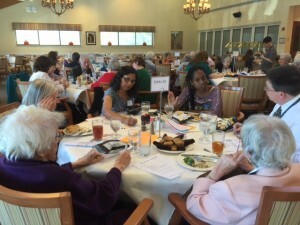 As a Quaker retirement community, Pennswood Village strives for diversity in many ways. Pennswood’s Board of Directors has organized a Diversity Task Force to take on the challenge of enhancing, celebrating and honoring diversity and inclusiveness at Pennswood Village. The task force is made up of residents, staff, board members, and several people from the broader community and is responsible for arranging and encouraging diversity efforts. “Everyone has a story, and they’re interesting and worth listening to,” says Betsy Crofts, former board member and Diversity Task Force member.